The China Railway Corporation (CRC) says it intends to raise fixed-asset investment to 660 billion yuan ($106.5 billion) in 2013 in a bid to boost the country’s infrastructure. CRC also announced that it will be spending more than 50 billion yuan ($8.2 billion) to buy locomotives, bullet trains and cargo carriers. 5,500 km of new railway lines are expected to be operational by the end of this year, bringing the total to 100,000 km. In the first seven months of this year, the CRC has invested 261.7 billion yuan in railway fixed assets, up 16 per cent year on year. CRC took charge of China’s railways from the Railways ministry which was dismantled in March into administrative and commercial arms. In a landmark move for Chinese railways, the new body has been opened up for private investment. China’s investment in railway infrastructure increased 28 per cent to $8.65 billion in the first three months of 2013, according to the China Railway Corporation (CRC). 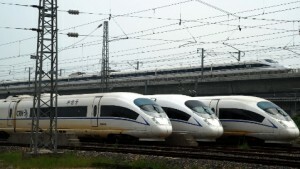 A high-speed rail line in China has opened linking the cities of Nanjing, Hangzhou and Ningbo in the Yangtze River Delta. The Yangtze River Delta region accounts for a fifth of China’s economic output.